I'm now at 12 1/2 weeks post my last relaxer touch up. By now I would have called my stylist to schedule an appointment, but I've decided to go another week or two before I get a relaxer touch up. Things seem to be going well with my relaxed hair and the green tea rinses seem to be working (woo hoo!) as I didn't have much shedding over the week. Thanks to everyone for encouraging me on the thickness of my hair. I realize it does have some thickness, but it's not as thick as it used to be and the left side of my head is not as thick as the right side. I do expect it to thicken up some more, but that will take time. Now on to what you're here for - my wash day recap! I sectioned my relaxed hair off into eight sections and applied Suave Natural Infusions Moisturizing Conditioner with Macadamia Oil while I detangled. I left this one for about 20 minutes, then I added sunflower oil to each section and left that on for another 20 minutes. After rinsing, my hair felt pretty good getting this wash day off to a good start. It was time for me to clarify my hair so I used the SheaMoisture Black Soap Deep Cleansing Shampoo by working it into my scalp. I rinsed once with water and once with green tea. After the green tea rinse, I applied a mix of Eden BodyWorks Jojoba Monoi Deep Conditioner and Suave Natural Infusions Anti-Breakage Conditioner with Awapuhi Ginger, left it on for about 30 minutes and then rinsed with cool water. I t-shirt dried my relaxed hair for an hour. After that, I sprayed on Pantene Pro-V Moisture Mist Detangler. Next, I applied Eden BodyWorks Coconut Shea Leave-in Conditioner that I mixed with sunflower oil. I finished drying under my hooded dryer with my new growth stretched to finish drying. I took special care to really stretch my new growth as the last wash day it ended up not as stretched as I would have liked. Right after I came out from under the dryer I noticed my hair felt a little stiff, but after a few minutes it softened up nicely. 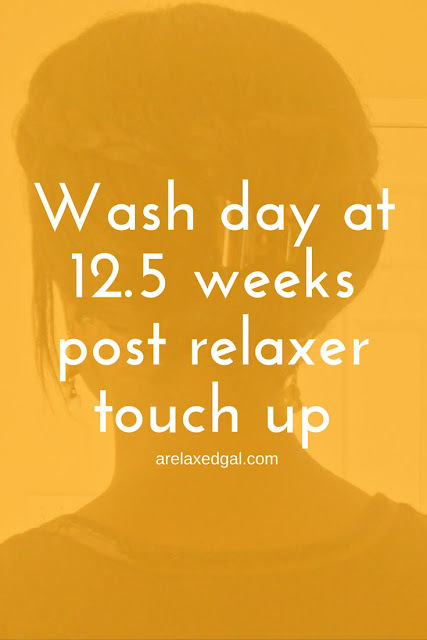 I wanted a few minutes for my relaxed hair to cool before applying any additional product to it. Next, I sealed my ends with coconut oil and then cross wrapped my hair for bed. If you read my last wash day post you may have realized that there was a step I didn't include - steaming. Since I was using mainly moisture based products I didn't want to go overboard and decided to skip the steam. I do plan on doing it again, maybe next wash day. I also think I'm going back to the hot oil treatment for my pre-poo. While these washday results were good, I kinda feel that the results when I used the hot oil treatment were better. First of all---*confetti toss* for making it to 12+ weeks post and not being ready to call the stylist! What an accomplishment! Thanks KLP! Definite confetti toss. I love your prepoo treatment! I have fallen in love with the Suave Professionals line. I'm going to have to try that blend of conditioner and sunflower oil. Awesome wash day! Thanks Candra! I'm a big fan of Suave Professionals conditioners. Every time they come out with a new one I want to try it!